Once the data is on the device, no additional transfers are required (unless the data needs to be written back to the host because it was modified on the GPU). The transfer of larger blocks of information across the PCIe bus is more efficient that many little transfers. “Nicholas Wilt, author of “The CUDA Handbook” notes that from a performance perspective it is important that touched device memory pages be lazily copied only as needed. [Ed. 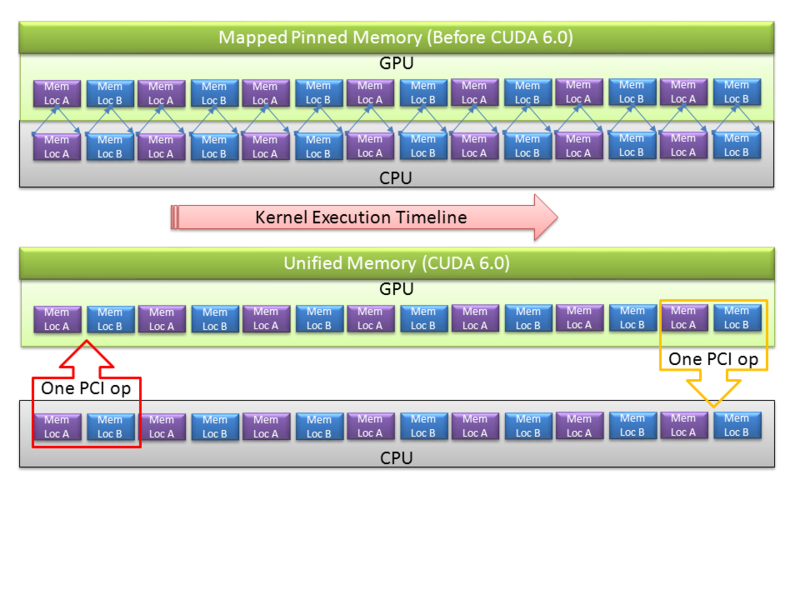 Note] NVIDIA commented (7/24/14) on the use of GMAC in CUDA Managed Memory. It is understandable why NVIDIA has not delved deeper into the differences between GMAC and CUDA Managed Memory, but we do know that full lazy copy works (hopefully through the use of MMU dirty bits!). Presumably other differences leverage NVIDIA hardware for greater performance. “An asymmetric distributed shared memory model for heterogeneous parallel systems“. I. Gelado, J. Cabezas, N. Navarro, J. E. Stone, S. Patel and Wen-mei W. Hwu. In proceedings of the Fifteenth International Conference on Architectural Support for Programming Languages and Operating Systems (ASPLOS 2010) . Pittsburgh, USA. March 2010. Reduce the complexity of your code. GMAC transparently takes care of the consistency and coherency of the data both used in the CPU and in the GPU, so your code gets simpler and cleaner. This means that you only have to use a pointer per allocation to access data both in the CPU and the GPU. 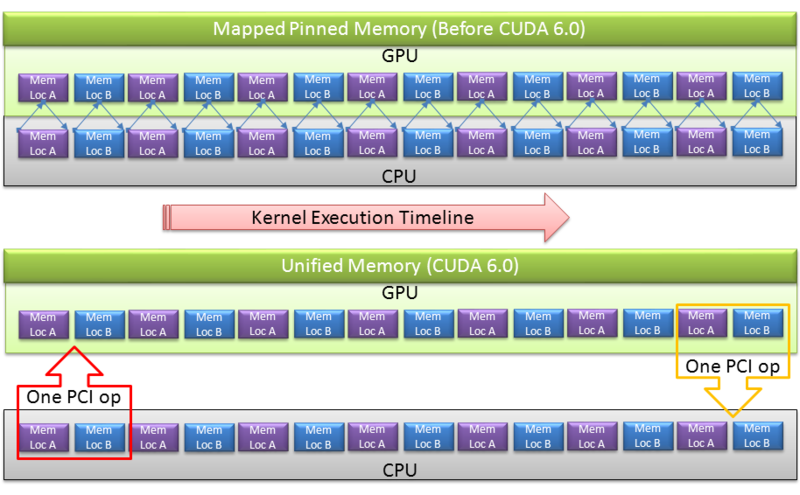 A challenge with the current implementation of the CUDA 6.0 Unified Memory is that the running kernel “owns” the region of memory. Some form of ownership is necessary to enforce a single-writer model and avoid the multiple writer concurrency problem. Anyone who has worked with a revision control system knows how complicated (and confusing) it can be to merge changes from multiple sources (e.g. the merge problem). With a single writer, there is no ambiguity about how to update a data block. Exclusive ownership causes problems in a multi-GPU environment (and even in a single GPU + CPU configuration) because it serializes access in a multi-device environment. Say we wish to share a common read-only region of memory among all the GPUs in a system. Exclusive ownership means that only one kernel on one device can run at any given time, and that nice multi-GPU system will only deliver single GPU performance. CUDA_MADV_READONLY: The read-only region of memory can be concurrently owned by multiple devices. Exclusive ownership is not required because no device will write to this region of memory. CUDA_MADV_READONLY_PAGEABLE: Similar to mmap() of a PROT_READ region of memory, this advice flag tells the runtime that the GPUs can share read-only regions of memory that are far larger than the actual amount of global memory on the device. This flag requires that the GPU have an MMU (Memory Mangement Unit) that can handle page faults. I understand that is not the case with the current NVIDIA GPUs.